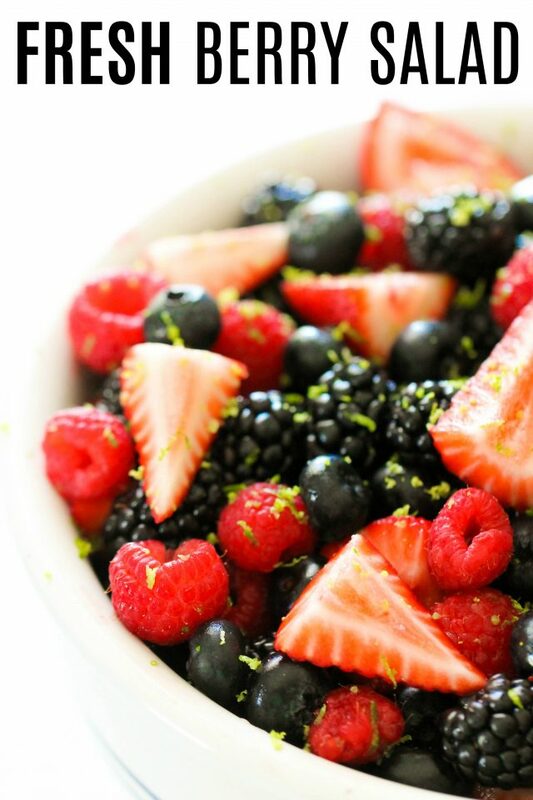 You only need 6 ingredients to make this Fresh Berry Salad. Loaded with all your favorite berries and fresh lime juice, this berry salad is the perfect side dish to bring to your next summer BBQ. I LOVE this time of year because it’s BERRY season. I think I’ve had strawberries at every meal for two weeks now. We had some friends over for dinner the other night and I realized I didn’t have a side to go with it. I threw together this simple berry salad, and it was a total crowd pleaser (and I didn’t have to buy a single ingredient!). This fruit salad is perfect for summer BBQs, neighborhood potlucks, or just to serve with your favorite hamburgers at home. It’s particularly inexpensive, while berries are in season. It would be extra tasty with fresh berries straight from your own garden, too. Is fruit salad a dessert? 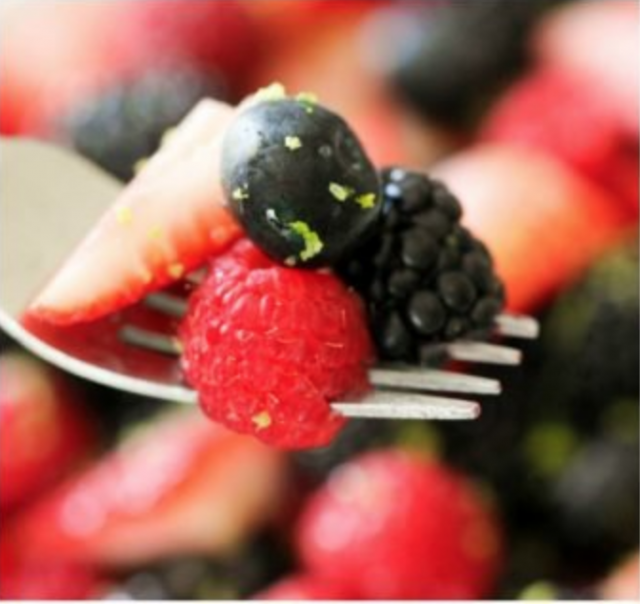 While many people would consider this berry salad a “fruit salad” side dish, it is definitely sweet enough (because of the sugars that naturally occur in the berries) that it could be served as a dessert as well. As far as desserts go, it would be a much healthier option because of the minimal amount of added sugars. It would be delicious served with some creamy Greek yogurt or angel food cake. The best thing about this fruit salad (besides the taste!) is it’s simplicity. After quartering your strawberries, toss them together with the additional berries and apple juice. Squeeze the lime juice over the top, and sprinkle on lime zest for added flavor and color. We love this salad best served cold, which makes it perfect for hot summer days. This fruit salad recipe is extra versatile, too. You can easily add double of one fruit and forgo another if your kids don’t like, say – blueberries (not that I’m speaking from experience or anything). But you can easily adapt it to fit whatever fruits you have on hand. You can easily make a small batch of this berry salad if you’re just wanting a light snack, or if you’re making this recipe for a big crowd it can easily be doubled or tripled, too. We love this recipe as-is, but you can easily substitute in other fruits or extras. Here are some of our favorites. Did you know we have a YouTube Channel? 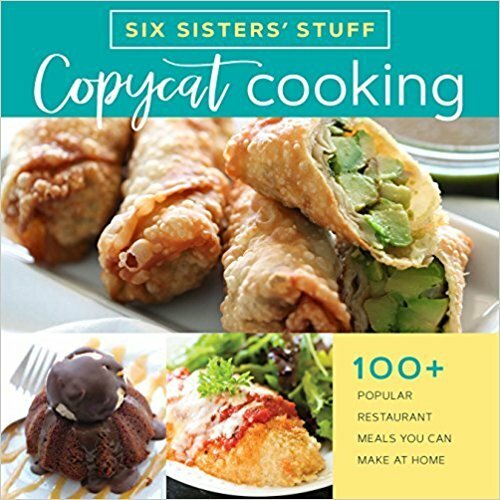 Watch all of our favorite recipes! Toss together strawberries, blueberries, blackberries, raspberries and apple juice. Zest lime, and set zest aside. Squeeze the juice of the lime over the berries, then top with lime zest. You only need 6 ingredients to make this Fresh Berry Salad. Loaded with all your favorite berries and fresh lime juice, this is the perfect side dish to bring to your next summer BBQ. Apple Juice and Lime zest - brilliant! Any excuse to eat a bowl full of berries, really. Yum!